Charles and Ray Eames were pioneers of molded plywood design, applying the technology to craft strong, lightweight casts for the American military during WWII. After war, they designed the sleek and unmistakably modern Eames Lounge Chair Wood (LCW). While it's been produced over using a vast array of materials and upholstery over the decades, it's still fundamentally unchanged today. In Kansas City, an architecture studio designed this adaptable house for a musician on a budget. The resident furnished the living area with an Eames coffee table and molded plywood chairs that she bought from a neighbor. The Eames fiberglass chairs were eBay purchases, and the Alba credenza is from CB2. The lithograph is by St. Louis artist Sage Dawson. An interior designer in Portland updated this 1950s home by a celebrated local architect. A vintage Molded Plywood Lounge Chair by Charles and Ray Eames for Herman Miller sits in front of built-in shelving in untreated hemlock. When you're running a company out of your home, you'd better hope you've got the space to keep everything in its place. Luckily, that's not a concern for printmaker Bob Weinstein and his Manhattan loft. Here he checks in with Spencer the dog, with an Eames plywood chair in the background. The resident of this renovated Brooklyn duplexed house inspects a drawing in his shared office on the home’s top floor. The space features a sloping ceiling that rises to ten feet at one end. The new wood of the inserted ceiling counterpoints the vintage pumpkin pine floorboards underfoot; an Eames LCW stands beside the table. By taking advantage of economies of scale, a Houston native and a pair of mod-minded developers team up to create nine affordable row houses in the Houston Heights. The clients' living room strikes a more rustic note. A multi-generational home in San Diego, California, elegantly combines sustainability and luxury; their living room is populated with a molded plywood Eames chair and a vintage Italian lamp. 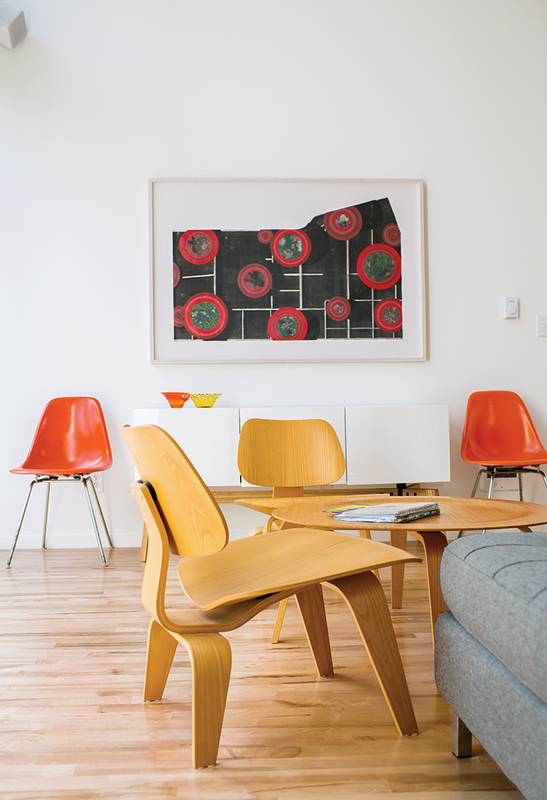 The living room of this hip flat by the architects of Gut Gut strikes more of a mid-century note with its Sunburst clock by George Nelson and an Eames molded plywood lounge chair. Gut Gut added a deep window seat where the kids now play. The window frame also houses a screen which, when rolled down, is used to project movies onto.